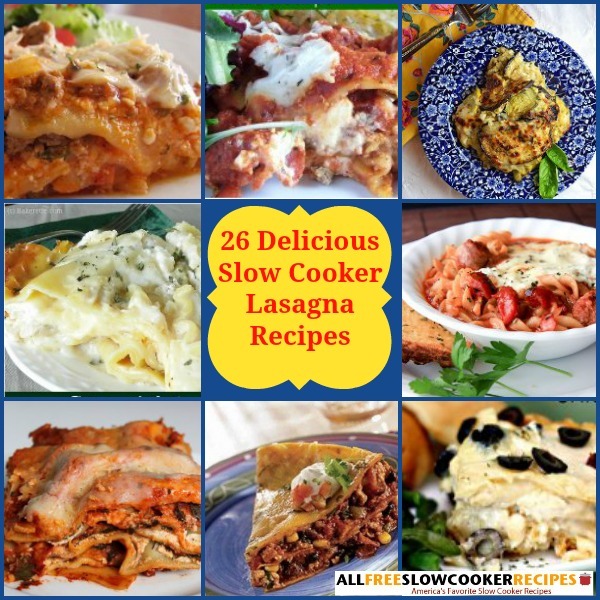 You can make easy lasagna recipes using your slow cooker with our collection, Slow Cooker Lasagna: 26 Delicious Lasagna Recipes for Dinner. In our comprehensive collection of slow cooker lasagnas, you'll find simple lasagna recipes for creamy chicken lasagna, meaty lasagna recipes, vegetarian lasagna recipes, and more. No matter the season or occasion, these are some of the absolute best ever lasagna recipes you'll find! From classic lasagna recipes, to unusual variations, you'll find a tasty assortment of easy lasagna recipes below. Whether you prefer a cream sauce, traditional red, a pesto, or even a sauce with a Mexican spin, we have so many slow cooker lasagnas from which to choose! Mix it up, and try them all! We've even included a bunch of slow cooker soups which are modeled after classic lasagna flavors! Most lasagna soup recipes are so hearty, you can serve them up as a main dish. Whether you want a bowl of soup, or a full-on lasagna, you'll be able to relish the savory and delicious flavors of lasagna. 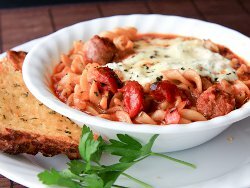 Slow Cooker Lasagna Soup (shown above)- This cheesy lasagna soup recipe cooks all day and serves eight. Serve it to a crowd or enjoy leftovers! All-Day Lasagna Soup - This lasagna soup is filing enough to be a meal, with ground beef, pasta, beans, cheese, and more. Better Than Lasagna Soup - This Better Than Lasagna Soup has all of your favorite lasagna ingredients in soup form. Top with mozzarella cheese for a fantastic weeknight meal. 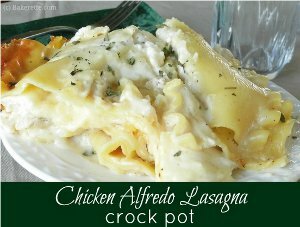 Chicken Alfredo Lasagna (shown above)- Chicken Alfredo Lasagna is rich, slow cooker recipe for lasagna, packed with chicken, two types of cheese, and a creamy Alfredo sauce. 5 Hour Lasagna - Italian-style chicken sausage links give this rich lasagna recipe a delicious flavor. Buffalo Chicken Lasagna - This recipe for Buffalo Chicken Lasagna puts a whole news spin on the traditional slow cooker recipe for lasagna that you'd normally expect. It's made with chicken breasts, pasta sauce, buffalo wing sauce, bell peppers, cheese and more. Chicken Alfredo Lasagna for Ten - This lasagna recipe is stupendous, made with Alfredo sauce, three types of cheese, chicken and more. All-Day Sausage and Chicken Lasagna for Four - Chicken breasts, Italian sausages, and Mozzarella cheese come together in savory harmony for this tasty slow cooker lasagna. Lazy Chicken Florentine Lasagna - This unique slow cooker lasagna recipe has a filling made with spinach, pesto, and mozzarella cheese. Top it off with Parmesan for the ultimate delight. Sweet Potato Alfredo Lasagna Bites - The slow heat allows the chicken, sweet potato, alfredo, chicken broth, basil, oregano and sage to melt together for a delicious and mouthwatering lasagna filling. So Cheesy Lasagna (shown above)- This easy lasagna recipe is packed with ground beef, cherry tomatoes, three types of cheese, more. Easy Slow Cooker Lasagna Casserole - A simple slow cooker recipe for lasagna, this dish includes two types of cheese and bell peppers. Four-Hour Slow Cooked Lasagna - This classic lasagna recipe only takes four hours in your slow cooker, and it's worth the wait! Slow Cooker Vegetarian Lasagna - This vegetarian lasagna recipe is filled with fresh ricotta cheese, and tasty veggies, such as spinach and zucchini. Slow Cooker Spinach Lasagna - This spinach lasagna recipe is perfect for a family of four and it's simple to prepare. Slow Cooker Pesto Spinach Lasagna Recipe - If you love pesto pasta, take it to the next level with this cheesy lasagna recipe. Must-Make Squash Lasagna - This slow cooker lasagna is made with pureed squash, ricotta, and mozzarella. Pesto Lasagna with Spinach and Mushrooms - Give your old lasagna recipe a break and try this refreshing take on lasagna with pesto lasagna with spinach and mushrooms. 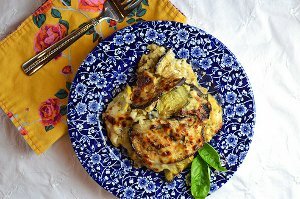 Summer Vegetable Lasagna (shown above)- Eggplant slices act as the noodles for this slow cooker lasagna recipe. It's also made with zucchini, chickpeas, and onions. The dish is cheesy and flavorful, thanks to mozzarella and basil. Slow Cooker Pesto Lasagna - Spinach, mushrooms, pesto, mozzarella, provolone, cottage cheese, and Parmesan cheese make the filling. Three-Hour Vegetarian Lasagana - This easy lasagna recipe is sure to be a hit at your next weeknight dinner. Slow Cooker Mexican Tortilla Pie - Tortillas are layered with refried beans, black beans, and cheese for delicious Mexican-style lasagna that can be made entirely in the slow cooker. 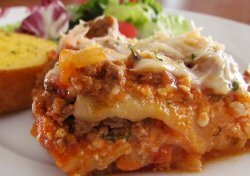 Beyond Easy Weeknight Lasagna - This lasagna recipe only take 3 to 4 hours to cook in your slow cooker, and it's extra easy to make because it incorporates pre-made ravioli. Slow Cooker Mexican Lasagna - Instead of using lasagna noodles, you use tortillas for layering. This Mexican lasagna recipe is packed with flavor. It calls for ground beef, but feel free to use chorizo sausage or chicken instead. 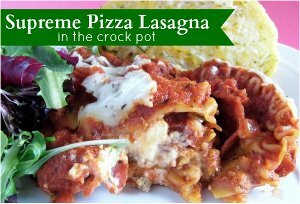 Supreme Pizza Lasagna (shown above)- Supreme Pizza Lasagna is an easy slow cooker recipe for lasagna, packed with favlor from ground sausage, pepperoni, chunky spaghetti sauce and both Ricotta and mozzarella cheeses. Slow Cooker Tortellini Lasagna Casserole - This slow cooker lasagan offers a new spin on classic dishes! Incorporate your favorite lasagna flavors, using tortellini! offer a new spin on classic dishes! Incorporate your favorite lasagna flavors, using tortellini!